Omnii RT15 - Performance with durability! 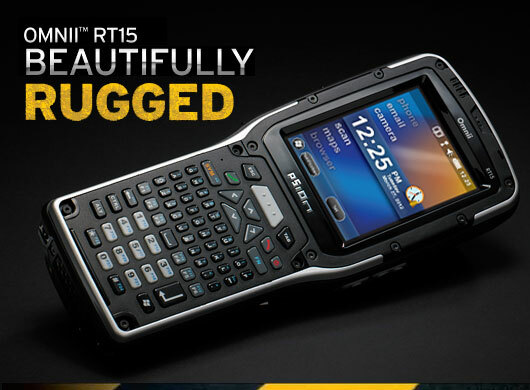 The new Omnii RT15 is a sleeker, customer-facing device that’s rugged enough to handle unforgiving field environments. It combines modularity, performance and durability for mobile workers. The RT15 leverages Psion’s single, versatile Omnii computing platform to help deliver new technologies quickly and easily. It can be simply configured to meet any business need – now or in the future – with no risk of obsolescence. Best suited for: Mobile workers like Field services, Postal & courier, Trucking & transportation, Mobile ticketing and Public safety. Seamless integration of Windows® CE 6.0 or Windows® Embedded Handheld 6.5 operating systems. Flexible & future ready with easy hardware reconfiguration. Extended battery life of upto 20 hours. Ergonomically designed with friendly user interface for more productivity.